Leela the cat has been with me since she was a small kitten. I adopted her on November 14, 2000. Last night, one day short of her 16th anniversary, she passed away in her sleep. This was not unexpected. For the last few days, she hadn’t been eating, she stopped using the litter-box, and she didn’t have any energy. I had planned to take her to the vet on Monday…so that she could be euthanized. I’m glad, in a way, that her last moments came quietly, and not while stuffed into a cage and on her way to the vet. I knew that I had to do it, but I wasn’t going to enjoy it, and it would haunt me forever. It’s better this way. Was she a good cat? That’s a contradiction in terms, isn’t it? It’s also hard to define. She wasn’t destructive, I’ll give her that. But while she was affectionate on occasion, it was always on her terms. In her last years, she would go and hide somewhere if I got up from a chair or walked toward her. (For the record, she was never abused, not once.) On balance I guess I would say she was a fine cat. 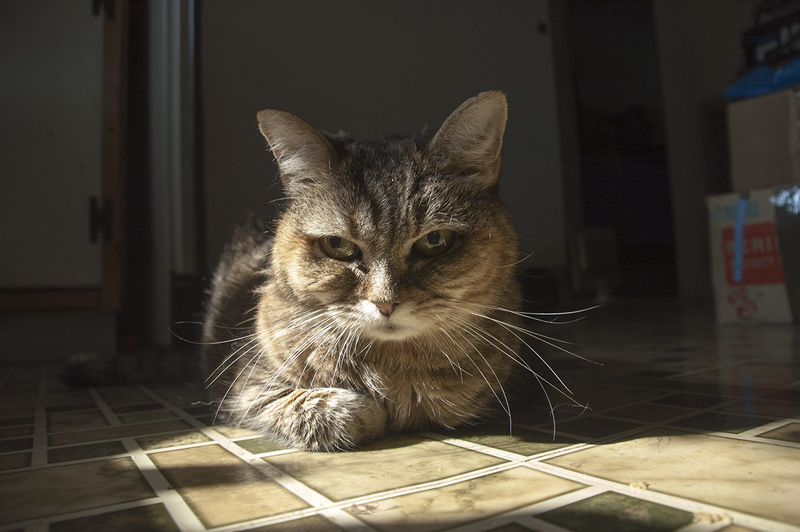 I’ve known better and I’ve known worse, and I like to think I gave her a good life for sixteen years. Below is the last photograph I ever took of her, on the night of the 12th.